Happy 2015, Friends!!! Life blog time – here’s a New Year’s Fabulous Friday for you, complete with my holiday recap, as well as my #OneWord365! To go forward, we have to go back…to November. Insert Taylor Swift pun, if you please. My Foodie Partner-in-Crime, Lara “The Healthy Fit Foodie” Lynne, and I were lucky to be part of a blogger social media sneak peek of the brand new Jillycakes bakery two weeks before their grand opening! Having the opportunity to meet and chat with Jillian Hopke, two-time winner of Cupcake Wars, as well as her Jillycakes crew, and friend and former competitor Emily Ellyn, was an absolute joy! Despite being slightly nervous, she was personable and sweet, and eager to answer any questions our nosy bloggy selves wanted to ask. She even led us through a decorating tutorial in which we each got to decorate our own turkey cupcake, complete with her delicious buttercream and candy corn feathers. We were able to try six of her wonderful cupcake flavors, including a crazy savory Thanksgiving Dinner creation, crafted with stuffing and cranberries, and topped with a swirl of mashed potatoes and a turkey gravy drizzle. It was to die for! Definitely tied for my favorite of the night was the Maple Apple Gingerbread – the flavors were so complementary. Lara and I split a dozen cupcakes for the road, and we can’t wait to head back to the brand new Winter Park storefront to get some more! #Jillycakester for life! Holidays, my 2015 anti-resolution, and my faves, after the jump! Pies and galettes and leaves to crunch and foooooood. 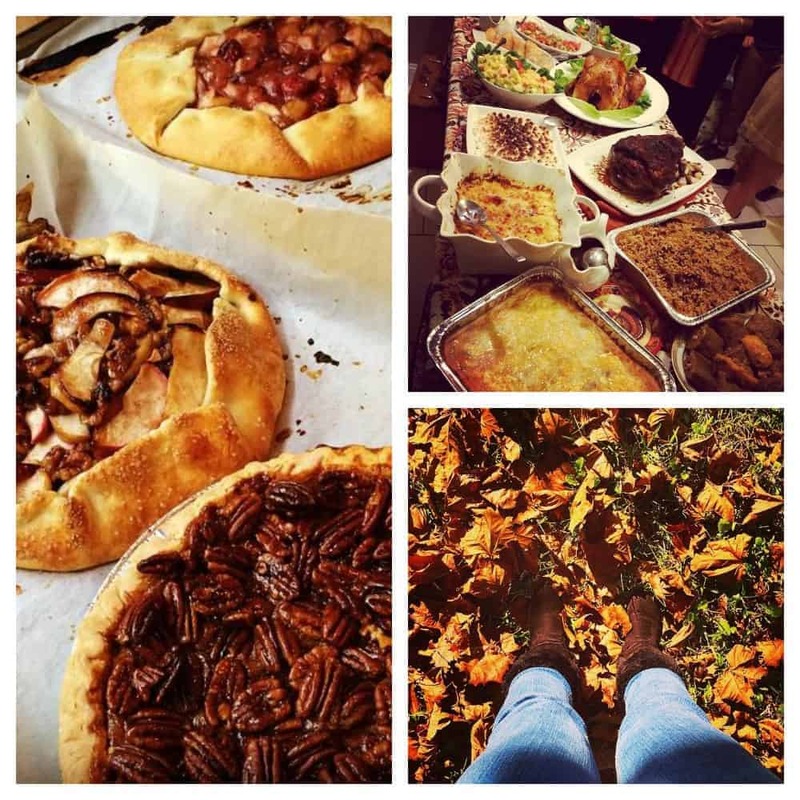 Thanksgiving 2014 was amazing! Thanksgiving was a whirlwind that I was sad to see come to an end. I rose pretty early to get started on dessert (which is always my contribution to any festivity), which this year included a Pumpkin Pecan Cheesecake Pie, and two different apple galettes. After dinner and dessert and a quick nap at my bestie Angel’s house, Mr. Crumby got a phone call from his family, wondering where we were and why we hadn’t made it for dinner yet. Oops! So off to the beach we went, and “choked” down a bit more food before I, once again, passed out on the couch. A full tummy is a happy tummy, but I am definitely convinced of the power of the turkey coma. In the blink of an eye, December was here, and Christmas Cookie Week 2014 was in full swing! I bake cookies every year, but I swear, I have never baked that many in such a short period before in my life. I shudder to think at how much butter and flour I went through, but it was so worth it! Seeing the smiles and joy in people’s faces as they eat my original creations is a high I can feel no other way. As soon as it arrived, Christmas was over for the year! But our lovely tree is still lit on a nightly basis, at least until January 7th! As long as we get it down by the time we leave for Europe next month, we’ll be set. On a serious note, looking back on the holidays, and the past year, has brought me to a realization about myself. Before beginning this blog, I had let complacency take a hold of my life. I was content with my work-eat-tv/read/game-sleep-repeat routine that I kept to on a daily basis. No life progression, no enrichment was coming from it, and even though I felt like there should be more happening in my life, I couldn’t put my finger on what it was, so I let the vicious cycle continue. When my amazingly supportive Mr. Crumby bought me my Nikon three Christmases ago, I couldn’t imagine the things I could do with it. I barely even touched it for the first year I had it, because it would take so much learning to use it properly. Despite having an advanced kitchen knowledge, I never knew how creative and original I could be, nor how much I would learn from Mr. Crumby, or by spending so much time poring over cookbooks and other food blogs. This blog helped me remember what having a passion feels like, and how to have a hobby that’s not just being lazy and bored. What I’ve come to realize is that I have a talent, a gift that goes beyond what I could have imagined for myself. It is not a unique gift, and it doesn’t make me better than anyone else. But it is mine, and I’m taking it and running with it. Instead of resolutions for the New Year, I’ve settled on one word to guide me through 2015. Too often, making resolutions just ends in disappointment for me, as I cannot keep to the many that I set for myself. So, instead, I’m going to succeed in some way, no matter how small, in everything I do. I’m going to thrive in my everyday life. I will grow as a person, a wife, a photographer, a writer, a friend, a blogger, and hopefully as a mother by year’s end. I will prosper both in my current career, as well as what may be a future one. What will your One Word be for 2015? This edition of Fabulous Friday features some of my favorite healthier recipes, as well as my usual indulgent treats! These Coconut Flour Pineapple Upside Down Crumb Cakes from my dear Lara Lynne are as delicious as any other upside down creation I’ve had. And the coconut flour makes for a built in pina colada taste, which everyone know I can’t get enough of! Erin had me at Cream Cheese with her Walnut Sticky Buns. Homemade cinnamon rolls rule!! Continuing on my current eggnog kick, these Spice Cupcakes with Eggnog Buttercream sound AMAZEBALLS. Black Forest Bacon Brownies. What. I’ve been struck dumb, I have no words. Except gimme!!! Oui oui! These Champagne Pear Crepes are getting me all revved up for Paris!!! These Coffee Jello Shots need to be in my life. So adorable! Holiday Leftovers Whole Grain Pizza. A very fun way to use up the last of your turkey! JAVA RUM CHATA SHOOTERS. WHY AM I SHOUTING?! BECAUSE RUM CHATA AND CHOCOLATE CUPS AND COOKIE BUTTER AND MARSHMALLOWS AND SOMEBODY HOLD ME. This Grapefruit Tequila Slammer has got to be as refreshing as it looks, right? We love fish in the Crumby house – I see this Citrus-Crusted Tilapia with Blood Orange Salsa being on our menu at least once or twice this year! Skinny Dark Chocolate Pomegranate Hazelnut Fudge. GASP. I don’t know how this is skinny, but sign me up!!! That’s it for this installment of my Fabulous Friday life blog! The internet is full of food to love, and this is just a small sampling of things on my “to try” list. Take me to your recipes! Leave me comments and let me know if there’s anything you think I should be falling in love with this week! Better yet, follow me on Instagram, Twitter, Facebook, & Google+ and leave your links there! Your tree was indeed beautiful. We decorated ours in all blue this year. Happy New Year and best wishes for a fabulous 2015 on the blog! Happy New Year to you, Shirley!! 2015 is gonna rock!! I love your one word! I can’t pick just one( typical). SO i actually have two: Create and Organize! I can’t wait to see you flourish! I think your words go hand in hand, which is great! I know you’ll be able to do both, my dear! Happy 2015!! I do the one word 365, too. Last year my word was love – to love more and to walk in love in every situation. This year my word is organize. Flourish is such a wonderful word! Here’s to a successful, prosperous 2015! My one word will be Focus. I need to remained focus on my goals, be they temporary goals or goals I stick with. My one word would be organize! I have so many things that center around that. Another organizer! One word is so much easier than a list, though! Good luck, Stephanie, and happy new year!! My word for for 2014 was focus, this year my word is capacity. How did your Focus work out in 2014? Capacity! Ambitious! Are you wanting to learn something new? 2014 for me was all about survival. This year, I choose ‘flourish’! It’s a great word! Broad, yet specific at the same time! 🙂 I look forward to seeing you flourish, also!!! That’s a Thanksgiving cupcake I have never heard of – topped with mashed potatoes? WOW! We had cupcakes for Thanksgiving but they were simply red velvet. All of this food looks good but since it is the beginning of the year I can’t stare at it too long. Trying to get back on the right track. Delicious looking post! Oh my gosh, why can’t I have a Jillycakes by me?!?! My one word for 2015 is health. Last year, I cooked through the food holidays on my blog so it’s definitely time to reset my body and eat healthier. I’m late to hop on the bandwagon here, but I love this update. Sounds like you had some lovely holidays and that the year is starting off strongly for you! And I absolutely ADORE your word of the year. This year is all about change for me, and I’m doing my best to prepare and embrace it, even though it’s scary to know everything is about to be completely different!